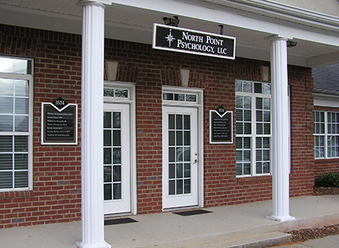 The office is conveniently located 0.9 miles east of GA 400 at Exit 10, Old Milton Parkway (120). From GA 400, go east toward Johns Creek/Duluth and cross over North Point Parkway. We are about 200 yards on your left, but you must go to the next light (Cotton Creek Entry/Brookside Parkway) and make a U-turn back toward GA 400 for about 100 yards. Turn right into the red-brick, single-story Olde Milton Commons office complex and go straight to the back. We are in the left corner of the back building. Excellent Soundproofing. The office building was designed specifically for a therapy practice, including elaborate soundproofing during construction to help ensure privacy and confidentiality of all conversations. The secret to a soundproof office is to have an air-tight office. This meant installing exterior doors (with seals) on all interior doorways and having separate ventilation in and out of each office. We also have sound channels under the walls and blown-in insulation and double sheetrock on all interior walls and ceilings. The offices here have the very best soundproofing you will find in any therapist’s office.